We love popcorn but not the convenient microwavable pouches. The real stuff. We don't want pricey miniscule gourmet packages or the pre-popped popcorn you find in the potato chip section of your grocery store. This makes popcorn hard-to-find in Canada. We've had some luck at Costco in the United States. We got popcorn in Florida and Detroit. We bought as much as 30 pounds. Once we found bottles of Orville Redenbacher popcorn near our home. We were very happy. With our supply exhausted, we searched online for nearby places with our favourite snack. You've seen images of large-scale automated factory farms that destroy our environment but make money for the corporate owners. Have you seen the other extreme, a family farm specializing in a specialty crop. You probably don't think of Canada as a popcorn growing country but we found an Ontario farm near picturesque Point Pelee National Park, which is near Windsor/Detroit. This farm does everything onsite from planting to packaging. If you like thrill rides or action movies, the tranquility and fresh air of a farm may bore you (especially during the off-season). You might even be outside a cell phone zone. You won't suffer long. Buying popcorn is quick. You pick a type, pick a size and pay. You're done in five minutes. The speed hardly warrants an eight hour round-trip from Toronto, though. Luckily, farmer Russell Jones spent over an hour giving us a tour and answering our numerous questions. Russell clearly loves popcorn and farming. This shows in his enthusiasm and license plate: P-O-P-C-O-R-N. You're instantly confident that you're getting top grade popcorn made as well as possible. We learned that popcorn is especially difficult to grow. Besides the whims of nature, the long growing season brings the risk of damage by frost. You can learn more on the Jones Popcorn website or by asking when you visit. Definitely, if you're in the area. Point Pelee is certainly worth seeing (same latitude as Rome and northern California). If you're visiting during the off-season, it's a good idea to phone ahead. You leave feeling enthusiastic about popcorn. We just wish there were free samples so we could taste the different types. We stocked up on butterfly and ruby-red popcorn. We got special salt with the consistency of fine flour. This type sticks much better than table salt and has a nicer taste. We then doubled our order. We had ruby red last night. Delicious! We are what we eat. So eat and share what's made with love and care. Jones Popcorn Farm sounds great! I'll make plans to visit next time I'm in the area. I'm surprised you have trouble finding large quantities of plain popcorn. I buy it at Bulk Barn. Even better if you can find a dry goods wholesaler (such as Grain Process in Toronto). 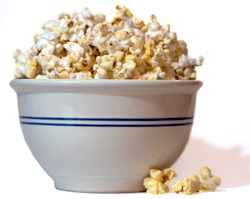 Thanks for the comment and suggestions for local popcorn sources. We know about Bulk Barn but were looking for some place with more varieties.